Willow: Ooh, Scott Hope at eleven o’clock. He likes you. He wanted to ask you out last year, but you weren’t ready then. But I think you’re ready now, or at least in the state of pre-readiness to make conversation, or-or to do that thing with your mouth that boys like. (Buffy gapes at her) Oh! I didn’t mean the *bad* thing with your mouth, I meant that little half-smile thing that you… (glares at Oz) You’re supposed to stop me when I do that. Oz: (smiles and shakes his head) I like when you do that. Oz: Are you guys all right? 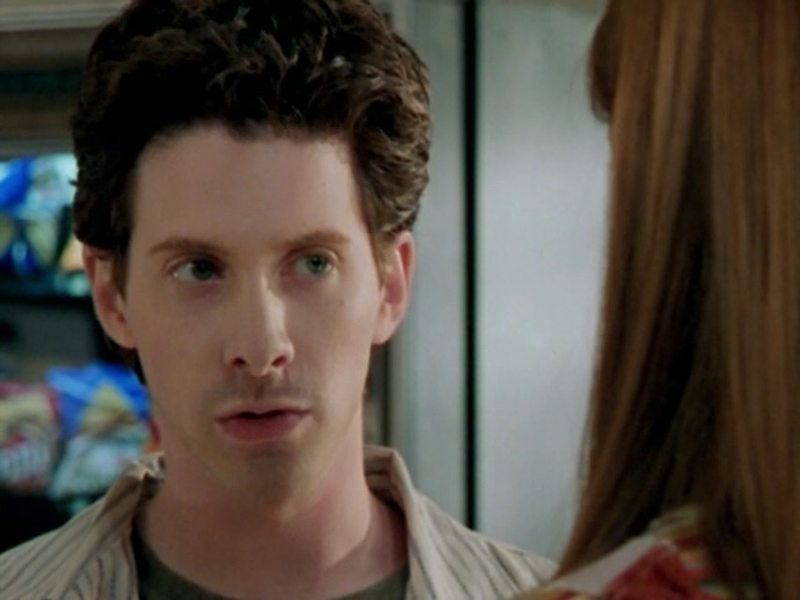 Oz: Wasn’t Andy Hoelich on the gymnastics team? Xander: That’s right, he was! Cheater! Okay, and the, uh, second problem I’m having . . . ‘Come and get it, Big Boy’? Willow: Well . . . W-well, the Slayer always says a pun or-or a witty play on words, and I think it throws the vampires off, and, and it makes them *frightened* because I’m wisecracking. Okay, I didn’t really have a chance to work on that one, but *you* try it every time. Oz: Uh, if I may suggest: ‘This time it’s personal.’ I mean, there’s a reason why it’s a classic. Xander: I’ve always been amazed with how Buffy fought, but . . . in a way, I feel like we took her punning for granted. Oz: Oh, hey! Animal cracker? Willow: No, thank you. How’s your arm? Willow: You can still play the guitar okay? Oz: Oh, not well, but not worse. Willow: Y’know, I never really thanked you. Oz: Ooo, yeah, please don’t. I don’t do thanks. I get all red. Have to bail. It’s not pretty. Willow: Well, then forget that thing. E-especially with the part where I kind of owe you my life. Oz: Oh, look! Monkey! And he has a little hat. And little pants. Oz: The monkey’s the only cookie animal that gets to wear clothes, you know that? Oz: You have the sweetest smile I’ve ever seen… So, I’m wondering, do the other cookie animals feel sorta ripped? Like, is the hippo going, ‘Hey, man, where are *my* pants? I have my hippo dignity!’ And you know the monkey’s just, ‘I mock you with my monkey pants!’ And there’s a big coup in the zoo. Willow: He’s shot! Are you okay? Oz: I, uh, I’m shot! Y’know. Wow! It’s odd! And painful. Willow: Hey! Your hair! Is brown! Oz: Oh, yeah, sometimes. So, uh, did you decide? Are you gonna be a Corporate Computer Suit Guy? Willow: Oh. Uh, well, I-I think I’m gonna finish high school first. What about you? Oz: I’m not really a computer person, you know. Or a work of any kind person. Willow: They why’d they select you? Oz: Oh, I sorta test well. Y’know, which is cool. E-except that it leads to jobs. Willow: Well, don’t you have some ambition? Oz: Oh, yeah! Yeah. E-flat, diminished ninth. Oz: Well, the E-flat, it’s, it’s doable, but that diminished ninth, y’know, it’s a man’s chord. Now, you could lose a finger. Oz: Still not clear what I’m supposed to try. Oz: That is a tense person.